The Fisher Isotemp Stirrer brings you consistent sturdy magnetic stirring, on a sturdy 4 x 3” platform. The epoxy coated aluminum surface of this lab stirrer is chemically resistant and tough to scratch up, while the bright white coloring provides contrast against samples. 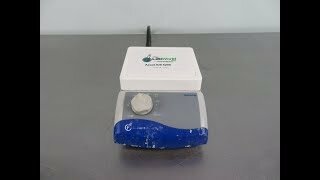 The analog knob of this magnetic stirrer will control the speed between 60-1200 RPM with a slow start to prevent splashing and is easy to control even when using a heavy glove. This lab stirrer is microprocessor controlled to help maintain consistent stirring even with changing viscosities. At the rear of this magnetic stirrer is a mount for a support rod up to 13mm in diameter. This Fisher Isotemp Magnetic Stirrer 11-600-16S has been thoroughly inspected and reached it's max speed easily. All of our lab equipment comes backed with our standard warranty. Should you have any questions, please don't hesitate to contact us.